You are at:Home»Society»Military»October 7, 1940: Why Do People Think FDR Planned Pearl Harbor? October 7, 1940: Why Do People Think FDR Planned Pearl Harbor? On October 7, 1940, the Director of the Far East Section of the Office of Naval Intelligence, Lt. Cmdr. Arthur McCollum, sent an infamous memo up his chain of command that seems to recommend the United States provoke Japan into attacking US forces, thus allowing the US an excuse to enter World War II (WWII) in spite of President Roosevelt’s promise to stay out of the war. McCollum was responsible for reading and interpreting the decoded intercepts of Japanese secret radio traffic and for monitoring the political and military situation in the Far East. In 2001 a book by Robert Stinnett, Day of Deceit: The Truth About FDR and Pearl Harbor, made the case that Roosevelt intentionally sacrificed the US Pacific Fleet at Pearl Harbor to a Japanese attack intentionally provoked by US actions as a pretense to allowing Roosevelt to get the US into World War II. FDR knew the American people wanted to stay out of foreign entanglements and would not stand for a violation of his campaign promise to keep out of the war, so he needed a casus belli that would give him the support of the people in entering the war. Many US military and political leaders expected Japanese reaction to US provocation and embargo of vital raw materials to generate offensive action by Japan, and Admiral Chester Nimitz refused command of the Pacific Fleet so as to avoid being made a scapegoat for the inevitable debacle a surprise attack would generate. McCollum did not have a direct line to President Roosevelt, and himself denied advocating for intentionally triggering war with Japan, facts overlooked by Stinnett in his book. Still, the Eight Actions recommended by McCollum certainly could be expected to infuriate the Japanese and quite possibly provoke an attack, if not certainly provoking war. The deployment of ground and naval forces including submarines into territory Japan wanted to control, support of the Chinese under Chiang Kai Shek, and support of the Dutch against Japanese demands for concessions seemed sure to provoke the Japanese. The last “action,” that of the US embargo against Japan on all trade by US and Britain would likely be the last straw and almost force the Japanese to attack the US and Britain. 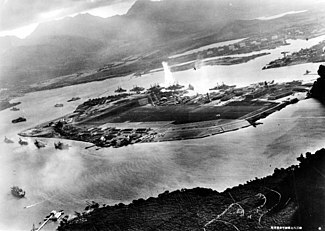 Despite any proof that President Roosevelt ever even saw the McCollum memo Stinnett’s book led to widespread acceptance of the theory that FDR and the US intentionally goaded Japan into attacking Pearl Harbor, although it says nothing about whether or not the attack was intentionally permitted to succeed so spectacularly. Other mainstream historians analysis of the memo and the broader situation come to the conclusion that there was no conspiracy to provoke a Japanese attack and no intention of hiding the coming attack from US military commanders in the Pacific. The subject remains open to debate, like so many others. Questions for students: Do you think the US intentionally provoked war with Japan as an excuse for entering WWII on the side of Britain? Do you think Pearl Harbor was a US conspiracy that sacrificed American lives for a political agenda? Please share your thoughts and opinions on these subjects with your fellow readers. The featured image in this article, a retouched picture of the wreckage of the USS Arizona ablaze after the attack, has been digitally altered from its original version. The original can be viewed here: The USS Arizona (BB-39) burning after the Japanese attack on Pearl Harbor – NARA – 195617.tif. Modifications were made by Mmxx. This work is in the public domain in the United States because it was published in the United States between 1923 and 1977 without a copyright notice.